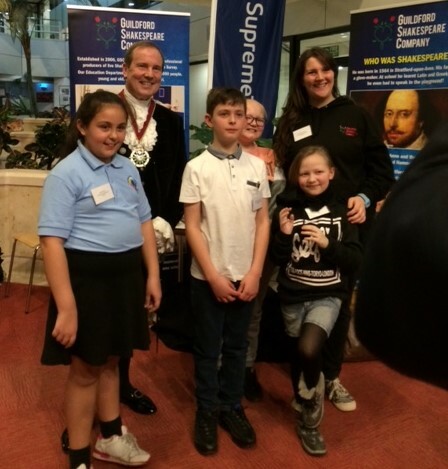 On Thursday last week our Education Officer Francesca McInally took three young actors from our Saturday Drama Group to Leatherhead to perform at the prestigious High Sheriff of Surrey Youth Awards... here's her account of a very special evening. Just on the train back from the annual High Sheriff Youth Awards. And what a wonderful evening it was! Our three beneficiaries from last year’s High Sheriff Youth Awards bursary were invited to perform for many distinguished guests including the High Sheriff, eleven mayors, various councillors and other local charities. One of our little actors commented that they “have never seen so much bling”. They presented the witches scenes from Shakespeare’s tragedy Macbeth. Their cackles filled the ExxoMobile House and their creaking voices spooked the bravest of dignitaries. Last year’s grant from the High Sheriff Youth Awards allowed three children from Weyfield Academy to join us on our GSC Saturdays Drama Club. Over the last year they have had many unique experiences; they performed in a promenade version of Alice in Wonderland, inspired by our professional company’s production and recorded Love’s Labour’s Lost at Eagle Radio. Last weekend they appeared at GLive as part of the Innovate, Science and Arts Festival.These opportunities would not be available for them to access normally due to financial constraints, and so these scholarships are vital in breaking down barriers; levelling the playing field and challenging the supposed elitism of Shakespeare. It has been a pleasure to witness the change in these individuals since they first joined us over a year ago. Their teachers have commented on the positive impact the drama club has had on their school lives: their confidence has improved, along with their ability to listen to others and resilience in taking risks. An unexpected result has been that their school attendance has vastly improved due to an increase in self-esteem and motivation. Upon seeing such fabulous results, we could not bare to lose these little superstars when the scholarship ended, so we at GSC decided to fund their places indefinitely. This year the High Sheriff kindly funded our pilot With My Eyes project, a free course of drama-therapy workshops for ten Surrey children and their parents. The course will be led by GSC staff and dramatherapists, providing each group with a new social support network. I couldn’t have been prouder of the three of them tonight. They performed with vigour, spoke to the distinguished guests with confidence and passion and managed to gobble down more chips that I thought was humanly possible. They did Guildford Shakespeare Company and Weyfield Academy proud.